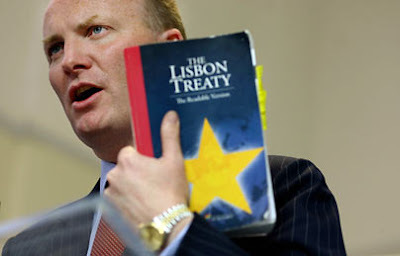 Declan Ganley has decided to rejoin the campaign against the Lisbon Treaty in Ireland. Despite Ganley being a eurofederalist (he mistakenly thinks it can be reformed like the Tories) and a bit of a prima donna, this is good news. I have expressed concerns recently that the Irish might see UKIP's involvement in the Irish referendum as undue interference from imperialists and that has, indeed, been one of the arguments used by the "yes" camp. It also means that the "no" campaign isn't being spearheaded by a party that is fully anti-EU, thus depriving the "yes" campaign of the argument that UKIP is only involved to try and break up the EU (another one they've tried). Let's hope that Ganley hasn't left it too late to start campaigning for a "no" vote. This is good new for the no campaign. Declan Ganley is a good campaigner and has a lot of support in Ireland. Welcome back to the fight Mr Ganley.